It doesn&apos;t seem that long ago that most of us were in grade school, happily coloring cornucopias as teachers retold the story of the first Thanksgiving, where the Pilgrims and Native Americans got over their differences and broke bread like the best of friends. Unfortunately, much like Columbus Day, Santa Claus and Valentine&apos;s Day, America&apos;s annual turkey feast is based on a bunch of baloney. History is written from the perspective of people with power and privilege. When the perspectives of Native Americans are taken into account, the story of Thanksgiving and its aftermath isn&apos;t such a feel-good narrative. So while celebrating with friends or family this year, take a moment to be mindful of what really happened during the Pilgrims&apos; first feast and how most Americans came to celebrate Thanksgiving. 1. The first Thanksgiving didn&apos;t happen when the Pilgrims landed. The first meal in 1621 wasn&apos;t even called Thanksgiving, and it didn&apos;t happen immediately. When the Pilgrims arrived in November 1620 and met the Wampanoag tribe soon after, there was no harvest feast — the Pilgrims hadn&apos;t yet planted and were trying to figure out ways to survive. The event we have based the Thanksgiving narrative on only occurred later, after the Wampanoag taught them how. And the concept of thanksgiving itself wasn&apos;t brought to America by the Pilgrims. While back in England the Pilgrims had given thanks for specific events in special church services, the Native American peoples had long maintained their own ways of giving thanks. 2. 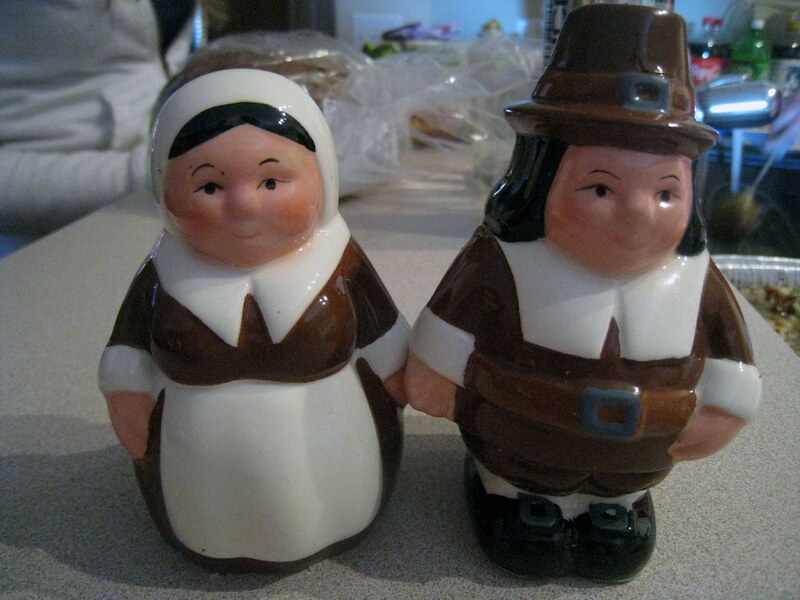 The first Pilgrims and Native Americans weren&apos;t on super friendly terms. In fact, the relationship between the two groups was more political than friendly. From the beginning, the Pilgrims had worked out an arrangement in order to live on land belonging to the Wampanoag tribe. After the Pilgrims landed, they signed a treaty with the Wampanoag, an agreement for mutual protection between the groups and established guidelines that would allow them to live in community with each other. While the meal now known as Thanksgiving was peaceful, just a few years later, in 1637, things got a bit more violent. While Pequot warriors in modern-day Connecticut were away, a band of other tribes and the English colonists — including the Pilgrims — massacred and burned about 400 to 700 Pequot women and children. This violence would set the tone for the next 200 years of interactions between white settlers and Native peoples. 3. Turkey probably wasn&apos;t on the menu, and the same goes for pie and stuffing. The only meat likely on the menu at that first meal in 1621 was venison, although it&apos;s possible some wild fowl were shot for the feast as well, according to National Geographic, which could have included variations on turkey. Other items included corn, succotash, squash and seafood. The pumpkin pie, cranberry sauce and other current table staples are modern adjustments. And it wasn&apos;t just one sit-down meal. The Wampanoag came and went as they pleased over the course of the feast, which was spread out over 3 days. After all, the settlers were on Native land. The modern interpretation of the feast was most likely popularized in the mid-19th century, when nostalgia for the Plymouth era peaked. Around this time, women&apos;s magazine editor Sarah Josepha Hale started publishing Thanksgiving recipes, which included a lot of the food we now think of as traditional, especially potato dishes. 4. The feast itself had nothing to do with organized religion. Given that both groups, including the Wampanoag, celebrated different religious traditions, the feast in 1621 was not part of any religious ceremony. An interview with the Indian Country Today Media Network tells the Wampanoag side of the story, which indicates that it was a more of a political function, since the Pilgrims were in their territory. "We give thanks more than once a year in formal ceremony for different season," said Ramona Peters, tribal historic preservation officer for the Mashpee Wampanoag Tribe, in the interview. "For the green corn thanksgiving, for the arrival of certain fish species, whales, the first snow, our new year in May, there are so many ceremonies." 5. The Pilgrims didn&apos;t all wear black and white — or buckles. It&apos;s the wardrobe commonly believed to have been worn by the Pilgrims, and it&apos;s displayed in the pages of children&apos;s coloring books and immortalized in school plays across the country. But like so many other details, the black and white outfits and buckles are inaccurate. Black and white was only on Sundays and during more formal occasions, the History Channel notes. Meanwhile, buckles didn&apos;t become an American fashion staple until much later in the 17th century. A more accurate depiction would include clothes with neutral and even earthy colors, such as brown and green. 6. The Pilgrims&apos; feast did not take place in late November. Although not wholly untrue, the first feast was a celebration of the Pilgrims&apos; first harvest in America, so it took place sometime between late September and early November. Thanksgiving Day as we know it now takes place on the fourth Thursday of November because that&apos;s the day President Franklin Roosevelt chose for an annual observance in 1941, National Geographic says. Similarly, the holiday didn&apos;t become a widespread observance until roughly 200 years later. According to the History Channel, Thanksgiving Day was first adopted in New York State in 1817, and President Abraham Lincoln declared it a national holiday in 1863, halfway through the Civil War. 7. Thanksgiving is not celebrated by all Native Americans. For some, the holiday is yet another reminder of a history of genocide and colonization. Others have their own traditions during that time. Given how the folklore about Thanksgiving includes many Native American stereotypes, cultural appropriations and flat-out lies about what happened with the Pilgrims, the day is often reviled. "It is ironic that Thanksgiving takes place during American Indian and Alaskan Native Heritage Month," said Dennis Zotigh, a writer and cultural specialist for the National Museum of the American Indian said in a blog post. "An even greater irony is that more Americans today identify the day after Thanksgiving as Black Friday than as National American Indian Heritage Day."